There’s a lot to do, but no place to go—this may be the worst-kept secret of the urban experience. You’re planning a day in the Mile Square. It’s summer. Lots of outdoor activities are on tap, kayaking on the Hudson and beer on the pier with long lines for the can, maybe some tennis, and a stroll through the park. So, what’s the civilized solution to public peeing? Well, Hoboken discovered it when they installed the Portland Loo at Southwest Park in 2017. It looks kinda like a small Airstream Travel Trailer or even a gondola or super-enclosed bus stop. I was intrigued when one of our photographers, Victor Rodriguez, emailed me a picture a few months ago. Seems like Superstorm Sandy affected just about all of Hoboken’s future plans, including the design and location of its latrines. “The shape, the design, the durability of construction, it had to be flood-resistant to easily withstand wind, rain, flooding, the elements,” says Hoboken Business Administrator Stephen D. Marks. Evan Madden, sales manager for Madden Fabrication, the metal fabrication company that built the Portland Loo, gives the backstory. Apparently, Seattle, Washington, needed some public restrooms and bought five self-cleaning toilets from China. “News got out that they were causing drug use because they were too enclosed, and because they were bought in a foreign county, it took days to get parts, and they were costly to ship and purchase,” Madden says. The city had paid $5 million for five restrooms, which were removed within two years and sold on eBay for $12,000. This was bad press, and Portland paid attention. Randy Leonard was a Portland volunteer fireman and city commissioner, who recognized that Portland needed public “facilities.” They needed to be “strong and durable, cheap, and easy to clean and maintain,” Madden says. Leonard “took the fireman’s approach, hose everything down, rinse, and it’s ready to go. It was important that it be maintained throughout the day, so that it’s inviting and usable.” Leonard took the initiative to make it happen for the city. The key was to make them private while at the same time not so private that criminals and vandals could use them at will. The solution was to have “blind space for complete privacy at toilet level, with louvers on the bottom, so that you could still see feet,” Madden says. 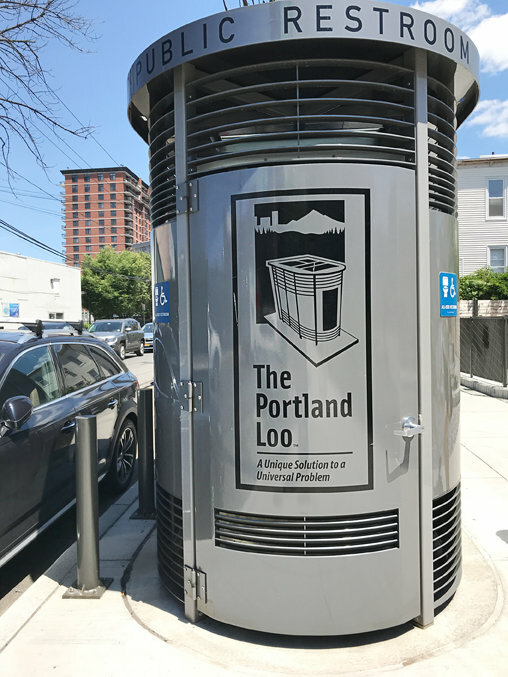 “Porto potties are not durable,” says Marks, who saw the Portland Loo in a trade magazine. “It fit the bill,” he says. And the price was right. It cost about $92,000, including delivery. With various grants and loans, the entire construction of Southwest Park cost $5 million, so the loo seemed like a good bet. Its highly visible location, right on Harrison Street and Observer Highway, as opposed to the middle of the park, also discourages criminal activity. “There’s traffic 24/7, and the police and the community are going in and out. It’s feet away from Crossfit and the Hoboken business center.” Marks points to future development plans for southwest Hoboken, with both commercial and residential properties, which will transform the area. Starr Whitehouse Landscape Architects and Planners designed Southwest Park. The U.S. Green Building Council, NJ Chapter, honored the architects with an award for Innovation and Sustainability Best Practices—Public for Hoboken’s Southwest Resiliency Park. One of the principals of the firm, Stephen Whitehouse, says the project was developed with the input of the community and the city council, which concluded that the park should include a bathroom.